Over $2.1 Million invested in this magnificent home! Luxury abounds on every level with architectural elements, sparkling pool and 35-acre lake! Open floorplan pays extraordinary attention to detail throughout entire home from the Brazilian cherry floors, deep crown moulding, 10' ceilings, paneled library and floor to ceiling windows! No detail was spared! Kitchen with 2 oversized islands, stone backsplash, walk-in pantry and high end appliances (Thermador/Viking/Bosch) welcomes a crowd but is still comfy for casual nights in. Family room with one of the 7 (yes 7!) fireplaces, built-ins and spectacular views of your own back yard oasis which includes, deck, pool/patios, built-in grill and Lake Albert! Second level with 5 large bedrooms and 4 full baths all have their own walk-in closets! Walkout lower level is great for gatherings...rec room/bar, home theatre, wine closet, fitness room, 2 baths and 6th bedroom all with walkout access to pool! Constructed by the luxurious Dior Builders! Quality craftsmanship home situated in the desired Tall Oaks of Kildeer & award winning Stevenson school district! Elegant chandeliers, tray ceilings & hardwood floors provide a stunning first impression. Grand foyer welcomes you w/ a cascading staircase & sought-after open concept layout. Spacious formal LR & DR. Top-of-the-line kitchen is graced w/ granite counters, island, high-end appliances, walk-in pantry, eating area & butlers station. Kitchen opens to family room that highlights a floor-to-ceiling fireplace & expansive windows. Impressive views from the Sunroom as you gaze at the serene setting of Albert Lake. Office, 2 half baths & laundry complete main level. Luxurious master suite boasts fireplace, sitting room, WIC & ensuite. W/O basement presents theatre, wet-bar, 2 baths, 2 beds & rec space, perfect for entertaining lavishly! Outdoor retreat features a 4-tier waterfall, Koi pond, deck, brick patio, & firepit. True Perfection! Immaculate custom beauty surrounded by sanctuary & serene views. Craftsmanship details adorn this stunning 4 bedroom suite home in prestigious Prairie Trails with award wining Stevenson High School district. Custom stained glass, tray ceilings, custom crown molding, extensive millwork, stone walls, architectural columns and custom window treatments throughout. Dramatic foyer greets you with a beautiful medallion inlay & an open FR & DR concept layout with an office on the main level. French doors in the grand family room lead to an oasis backyard with an in ground swimming pool. Top of the line kitchen appliances boast granite counters island w/breakfast bar, 2 pantries & large eating area, custom cherry cabinets with gorgeous glass inlay. 4 very large bedrooms and with walk in closets and all with private bathrooms. Finished english basement with exercise room. This well maintained home is truly a show stopper! A must see for those seeking superb craftsmanship! Looking for comfortable, quality home perfect for family time or entertaining & move in ready? This is a MUST-SEE! Nestled at end of quiet cul-de-sac in unique community: walking path/pond/children?s park. Home welcomes you to open floorplan & living room w/ fireplace surrounded by built-ins. Window wall overlooks wooded conservancy & in-grnd pool w/ auto-cover & fence. Adjacent family room, kitchen & maintenance-free deck w/ grill provides GREAT entertaining space! Custom-built, Amish cabinetry & millwork thru-out home shows in kitchen: lrg island w/ apron sink, 42? cabinetry, grnt counters, plng desk, wine frig, walk-in pantry & eating area surrounded by windows. Master suite w/ sitting area & spa bath. All bdrms: bath & W/I closet. Mudroom w/ private laundry. W/O bsmt has theater area, fireplace, rec area/bar & workout room. Leads to AMAZING 3-season room w/ retractable screens, fireplace, heaters, ceiling fans & views of perfectly kept yard. Enjoy spring to fall! Luxury & elegance awaits in this stunning 5-bed home adorned w/ unique custom finishes & millwork throughout! Prestigious Tall Oaks of Kildeer neighborhood & award-winning Stevenson school district. Dual-sided fireplaces, French doors, granite/stone accents & tray ceilings set the tone for this beautiful masterpiece. Grand foyer welcomes you boasting cascading bridal staircase & open concept views into DR & piano room. Kitchen graced w/ high-end appliances, island w/ BB, eating area, walk-in pantry & access to the deck. Relax in your master suite presenting fireplace, crown molding, his&her WIC's & spa-like bath. 4 addtl beds, each w/ attached bath & WIC adorn 2nd level. Entertain in grand style in your W/O basement complete with wet-bar, wine cellar, exercise room, rec room, office & so much more! Enjoy the outdoor oasis featuring screened porch, deck, multi-level paver patio, firepit & private views! Nestled on .86 acre lot w/ circular driveway, 4-car garage & immaculate curb appeal! Stunning Custom, One of a Kind Home! Attention to detail thru-out! Floating staircase, barrel ceilings, beamed ceilings, crown moulding, 4 Fireplaces! Quality Cabinetry, built-ins and unique touches! Gourmet kitchen that any "chef" will love! All season sun room, office, and a music room. Dining room with large windows and doors. 5 BR Up with walk in Closets. Second Floor Laundry room plus two other laundry areas in master and basement. Unbelievable finished walkout basement! Over 9700 SF includes finished basement space. Entertain with Indoor Sport Court and game room! Wet Bar, speaker system, Work out room! All the amenities you could ask for! Private lot, new deck, two new AC units in 2015. Exceptional beauty & craftsmanship details adorn this stunning 5-bed home ideally nestled in the prestigious Prairie Trails neighborhood & award winning Stevenson school district! Custom crown molding, tray ceilings & Alder wood doors are just a few of the finest details. Dramatic 2-story foyer greets you into the home w/ Italian Porcelain floors & an open concept layout w/ views into the DR & LR. Top-of-the-line kitchen boasts granite counters, SS appliances, island w/ breakfast bar, butlers pantry & large eating area showcasing serene outdoor views. 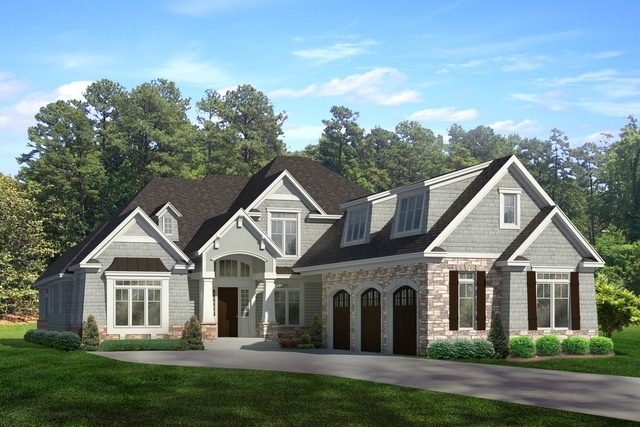 FR, located off the kitchen, highlights architectural columns, fireplace & coffered ceiling. Office, mudroom, 2 half baths & ensuite bedroom, ideal for in-law suite, complete the main level. French doors greet you into the master suite adorned w/ vaulted ceiling, fireplace, expansive WIC & spa-like ensuite. 3 addtl beds, bonus room & laundry adorn 2nd level. Immaculate finished bsmt w/ 2nd kitchen, rec room & full bath! True perfection!